He was born 1 February, 1962 in Alma-Ata. In 1984 graduated from Architecture and Constructions Institute of Alma-Ata. 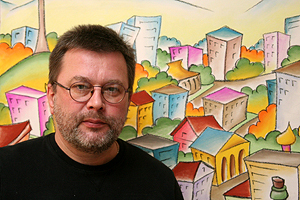 Then from 1984 to 1986 served in the army in Nikolaev, after that worked as an architect, then as an illustrator, and then as an architect again. In 1987 he tried to make cartoons for competitions. For now Igor participated in more than 70 home (Russia, Ukraina, Baltic countries) and foreign caricatures competitions and exhibitions (Belgium, Italy, Turkey, Poland, Yugoslavia, Bulgaria, France, Japan, Iran, Korea, Israel). He won prizes in: Russia (Voronegh-89, 91; Moscow-92; Tjumen-93, 96), Ukraina (Donetsk-92, 95), Italy (Ancona-91, 93; Marostica-92), Japan (Tokio-90,92, 96, 97, 98), Turkey (Istanbul-93), Belgium (Beringen-91; Brussels-98), Korea (Seoul-97), Izrael (Haifa-96, 97). Since 1992 lives in Alma-Ata and works in newspapers “Ekspress-K” and “Karavan”.